Hot on the track for the first time ever is the new Alfo Romeo Giulia Quadrifoglio, a super-sedan that may just be the brand’s best so far. The car is sure to be a fan favourite for those attending the Jaguar Simola Hillclimb. Sleek, powerful, and full of that Italian boldness the brand is famous for, ACCELERATE Special Gasoline will be fuelling two of these magnificent machines to race it out on the day! This Jaguar Simola Hillclimb, two of the South African motor industry’s best will #AccelerateToTheTop for the King of the Hill races in a pair of the new Alfa Romeo Giulia Quadrifoglios, fuelled by ACCELERATE Special Gasoline – Pierre Bester, and Piet Potgieter. Despite a late start to professional racing, Pierre Bester has participated in a variety of motoring events, including the regional VW Challenge, the Gymkhanas and RPT Tar Sprints, and several Michelen Cup events. An avid Jaguar Simola Hillclimb fan, Pierre first participated in the event in 2015 where he achieved 6th place, despite going up against highly modified cars. He took home gold in the A1 and A2 race classes in 2016 and 2017 respectively, achieving wins he had hoped for since childhood. We look forward to fuelling his race in the 10th edition of the prestigious event! Back for his second taste of the Jaguar Simola Hillclimb is Piet Potgieter, an avid motorsport fan who’s been racing for much of his adult life. Piet first raced the prestigious event in 2018 and returns this year under the Alfa Romeo flag once again – only this time he’ll be fighting for King of the Hill in Alfa’s new Giulia Quadrifoglio! Piet brings much experience to the track – he has raced on the Isle of Man twice before, and regularly competes in the Polo Cup. ACCELERATE Special Gasoline will be fuelling his race this year, where he hopes to better his third-place finish from last year! Another first to tear up the track in this year’s Jaguar Simola Hillclimb is former Fiat Factory racer Trevor Tuck, in his Alfa Romeo GTAM. Hand built by the South African racer in just 37 days, this 1969 masterpiece is not only a replica of the race cars used in the 1970s, but the model was also an Italian consulate car! Despite being and participating in the historic car class races, Trevor’s GTAM comprises some modern parts that may put the vintage piece ahead of the game – the car is FIA compliant, left-hand drive, and is powered by a twinspark, fuel injected engine. Trevor’s hand-built Italian paragon is a testament to the gruelling race ahead – as defending champion, he’s had to ensure he’s bringing his best to retain his title! Trevor participated in the 2017 and 2018 Jaguar Simola Hillclimbs as well, racing his famous “Giulia Caesar” in the H6 category and taking home gold both times. Having started his racing career in 2002, Trevor has always had a passion for cars, and raced for Fiat Factory racing from 2005 to 2007, earning the title of champion in 2006. Trevor will race his GTAM in the Classic Car Friday races, fuelled by ACCELERATE Special Gasoline. 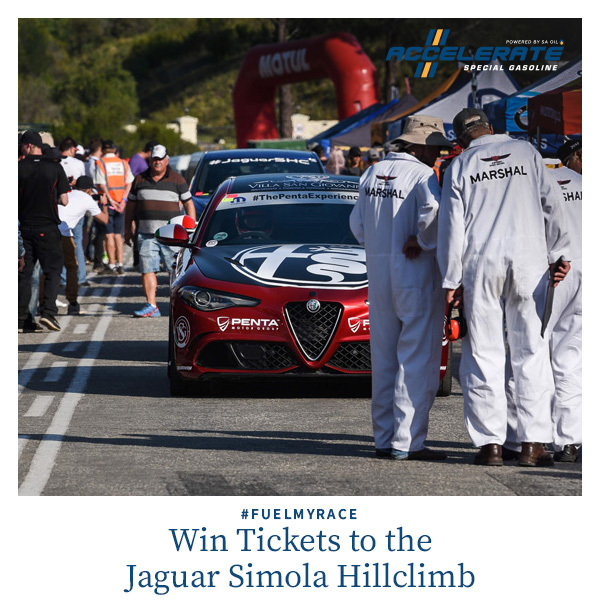 Between our ACCELERATE Special Gasoline-fuelled Giulia Qaudrifoglios, Trevor Tuck’s GTAM, and the got-you-on-the-edge-of-your-seat races they’ll be participating in, the 10th edition of the Jaguar Simola Hillclimb is definitely a motoring event you don’t want to miss! The winner will be selected at random and contacted via social media direct messaging. Good luck! * This competition is in no way endorsed, sponsored or administered by Facebook, Twitter or LinkedIn. Entrants agree to release these platforms from any liability. ** Winners will be notified by social media direct messaging. ***Winners will receive their tickets to the event via courier. ****Flights to and accommodation in Knysna not included. Fuel the power potential in your engine with ACCELERATE Special Gasoline, a high-octane, unleaded fuel specially formulated for high-performance engines. Fuel up with us!